When the blackjack dealer shows an Ace card, insurance can be offered to the players before any further cards are drawn. A player would take up the insurance bet, which is an independent bet from the original, if he thinks that the dealer will end up having a Blackjack, ie the Ace together with any 10 or face card (face cards being Jack, Queen or King). The insurance bet would be the value of exactly half of the original bet, so if the player is betting £100 on this hand then the insurance cost will be £50. The dealer will then proceed to offer further cards as usual to complete the hand. Once all players have held or taken cards as they would like, the dealer then takes her card. If it is a 10 or face card to make up the dealer’s hand to a blackjack then all bets lose (unless the player also had a blackjack in which case it will stand, or tie) and the insurance bets would win & be paid 2-1. If the dealer shows an Ace and a player has a blackjack then the player will be offered the option of being paid even money on his bet, or wait until the game is complete & if the dealer does not also get a blackjack then the player will be paid 3-2 for his hand. For example, this would be a pay-out of £150 on a £100 bet. Or in Las Vegas where the blackjack odds have been squeezed to 5-4 the pay-out would be £125. Should you take insurance if the dealer holds an Ace? The odds are that it is less than a 1 in 3 chance of the dealer adding a 10 or face card to that Ace, so playing by the odds insurance is not a good bet. However, if the dealer has been ‘hot’ (as they usually are!) then you may like to take insurance, or if you have a particularly large bet that you feel the need to protect. 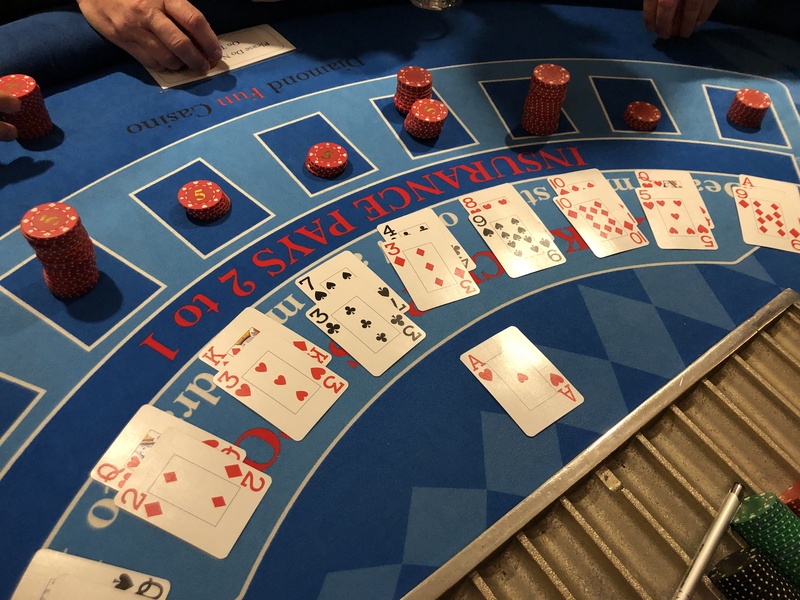 Our croupiers will be able to offer advice on how to play the odds at the table, but you could play according to the odds all day long and still leave with less than you started. The odds are stacked against you regardless of your game plan. The best bet is to play for fun only, with Diamond Fun Casino. The thrill of a live casino but without the risk of losing your money! We hire blackjack tables with professional casino croupiers to all areas for all events.